Successfully Added HK Warehouse Blackview BV7000 Pro Android Phone - Android 7.0, Octa-Core CPU, 4GB RAM, IP68, Two-IMEI, 4G (Silver) to your Shopping Cart. Meet the Blackview 7000 Pro, a sophisticated Android phone that features a stylish yet tough IP68 design. Being resistant against drops, dust, and water – this durable phone will meet your demands in the toughest of environments. Packed within its body lays a beautiful 5-inch Gorilla Glass 3 Display that portraits all your media in stunning detail and vivid color. From now on you’ll be able to enjoy your favorite movies, games, and Applications no matter where you’re at in 1080p Full-HD resolution. Simply head out to the play store to get access to an unlimited pool of free mobile entertainment and, with this Android smartphone at your side, there will never be the need to feel bored again. Running on an Android 7.0 operating system, this Blackview smartphone is guaranteed to deliver a smooth and powerful user experience that lets you enjoy the latest software features available. With its Octa-Core CPU and 4GB of RAM, this phone has no issues with handling games, Full-HD movies, and the latest applications. Featuring 64GB of internal storage and the added possibility to slide in a 32GB SD card, this mobile phone offers plenty of space for you to store all your files and media alike. Whether you’re into games, movies, or Applications – this Android phone will keep you entertained at all times. 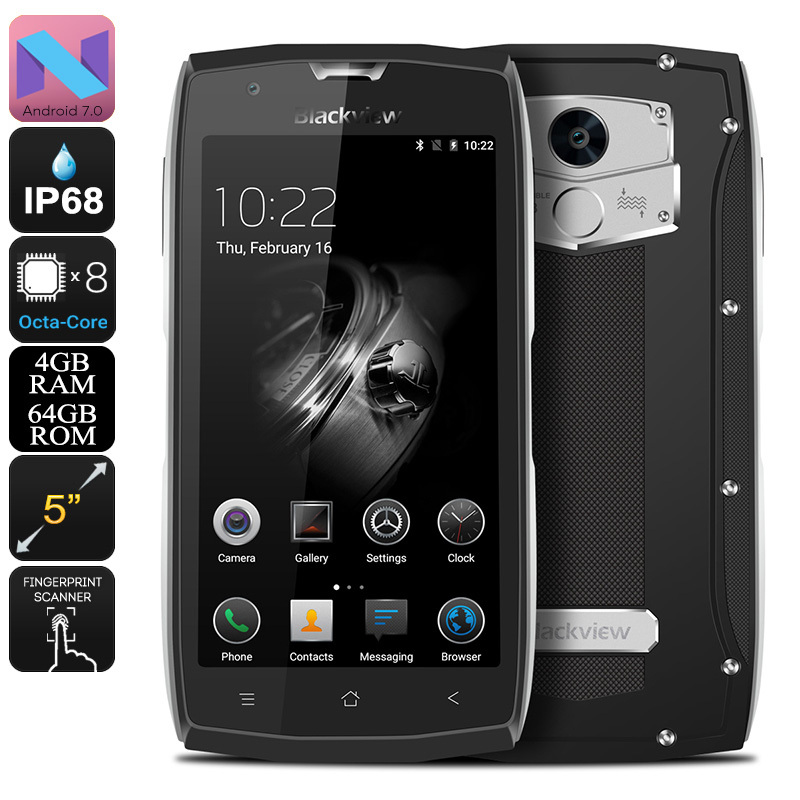 Like a true high-end Dual-SIM smartphone, the Blackview 7000 Pro features two IMEI numbers. Allowing you to be connected to two 4G network providers at the same time brings along great efficiency while traveling abroad or for separating your work and private life. 4G network support, furthermore lets you browse the web at lightning speeds and download files in the blink of an eye – ensuring that, with this Android phone, a laggy internet connection will be an issue of the past. Packing an epic 3500mAh battery, you will be able to enjoy all this mobile phone has to offer for a stunning 14 hours in a row – getting you through numerous days of excessive smartphone usage without needing to worry about battery life. At the rear of this Chinese Android cell phone, you’ll find a stunning 13MP camera that truly allows you to take your mobile photography to the next level. Shoot breathtaking photographs and crisp Full-HD video, nothing is too much for this professional-grade smartphone camera. Whether you’re attending a friend’s birthday party, a relaxing afternoon at the beach, or a hike during your upcoming holiday abroad – from now on not a single special moment in life will pass by uncaptured.